This is an one of a kind portal, where you can buy customized gifts and merchandise for yourself or your friends and family, ranging from custom jewelry, clothes, shoes, accessories and a lot more. And if you're someone who makes such things, you can tie up and sell your goodies here and earn! I wish this portal was there when I was making stuff. Maybe it would've become my sole business today. Anyways, the process is pretty straight forward, and the iCustomMadeIt team goes out of their way to make sure there are no issues with your order. 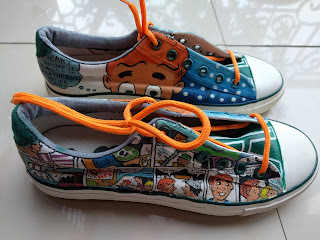 I gave forever wanted to paint my own canvas shoes, but I never got to doing that. So when I saw really awesome ones by Jugaad Factory on the website, I totally wanted to gift myself a pair for Diwali! You can select one of their designs and customize them, or you can ask to make one from scratch. I had planned on doing the latter, but I stumbled upon their comic strip design, and it was love at first site. 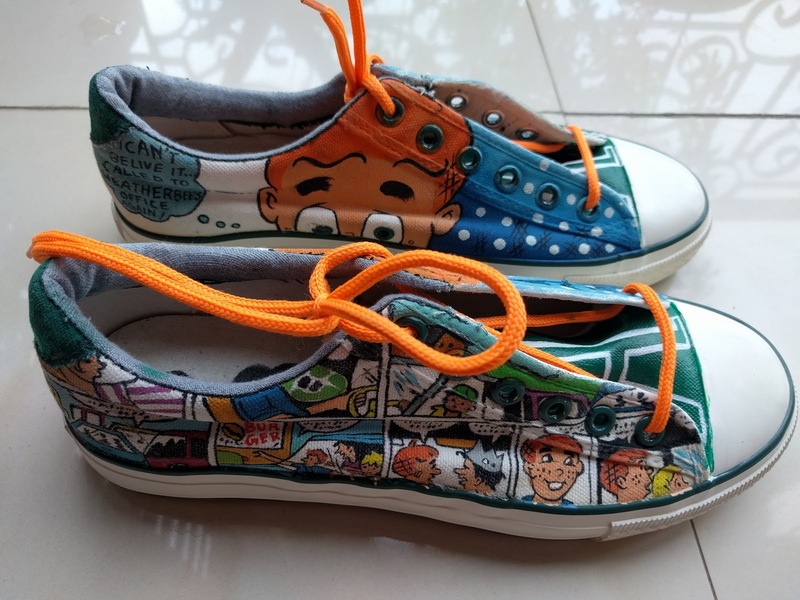 I love Archie comics and these looked like they were made for me. So I went ahead and ordered those. Once you place the order, www.iCustomMadeIt.com confirms it and calls you to understand what you want, if you need any customization. Then the order has to be accepted by the makers. I really loved the fact how equal importance is given to both the buyer and seller, and just because the buyer wants something, doesn't mean the seller has to do it. Once Jugaad Factory accepted to create my custom product, now the wait started. Mind you, these are not off the shelf products that you place order and can be shipped the next day and be in your hands within the week. These are creations made for you, according to your requirements, so patience is must. I can empathize with this coz I have been a creator myself and I know how much hard work goes into making something. The original design had the initial R on it, which I requested to change to A for Avantika (And Archie), and Jugaad Factory gladly accepted my request. 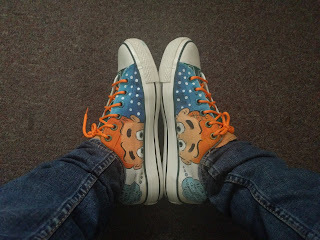 Within ten days, a couple of days before Diwali, a package arrived and my super-cool new kicks were here! They looked totally awesome, like any prize possession should be. In fact for the first couple of days I was so skeptical to even wear them, afraid that someone will spoil them. Ha-ha. The canvas shoes selected were quite heavy, so I cannot say that they're the most comfortable pair of shoes I own, but nevertheless, how cool they look makes up for that. I'm not sure if these are waterproof, but I'm assuming that like any normal canvas shoes, they're not. So I ought to be a little cautious about the fact. These cost me Rs.3750/- and if you understand the hard work that goes behind it, you'll be glad to pay the price. Imagine getting your favourite sports team or comic character or anything else painted on them! How cool would it be to flaunt them. What I love the most is the fact that when you order something from www.iCustomMadeIt.com, you buy something that is unique. There is just one of those in the entire world, and never ever will you bang into someone who is wearing the same thing! (Which is quite possible with things you buy otherwise from the common brands and their never ending sales). I hope I have roused enough curiosity in you to go check the portal for its wide offerings! Do comment away and tell me how you found my cool new sneakers to be! In a country like India, best vastu consultant dubai is considered one of the basic requirements while constructing a property or building according to pre-specified principles. It is necessary to follow these principles for wealth, health, fame and prosperity in life. Though it has become difficult to follow each and every principle in the present era, it is important to make maximum use of tenets in order to achieve peace and harmony in life.